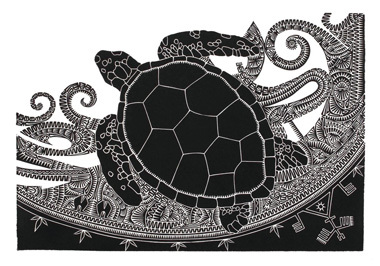 This exhibition features contemporary printmaking by Cairns-based Torres Strait Islander artists Brian Robinson and Joel Sam. Both artists have used a variety of printmaking techniques including linoprint, etching and embossing to produce innovative and distinctive works. The artists explored these techniques during artist residencies at Djumbunji Press, the KickArts Fine Art Printmaking Studio.